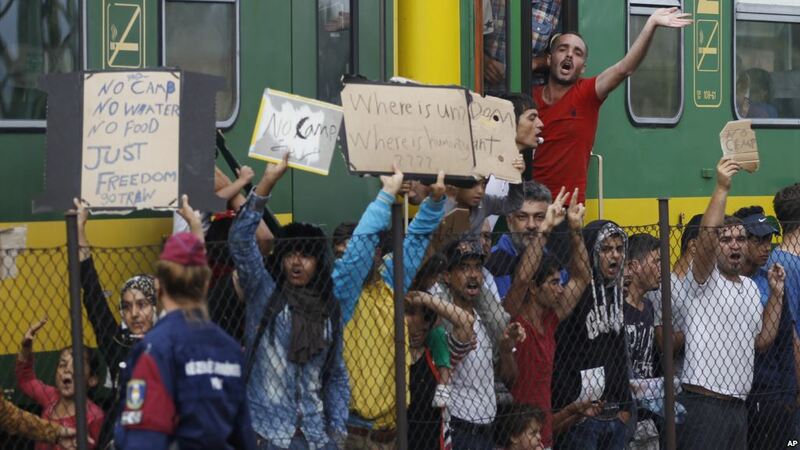 People shout slogans outside a train that was stopped in Bicske, Hungary, Friday, Sept. 4, 2015. The United Nations High Commissioner for Refugees has called on the European Union to admit up to 200,000 refugees for a "mass relocation program" to ease the flood of migrants appearing at EU borders looking for shelter. Antonio Guterres released a statement Friday asking the EU to implement a program that would require participation of all European Union states to help refugees with a valid need for protection. Guterres said the refugee crisis will be a "defining moment" for the European Union. He said an EU divided on the issue will benefit only smugglers and traffickers. 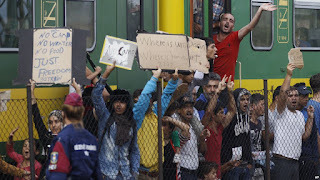 Meanwhile, in the Hungarian city of Bicske, hundreds of refugees are refusing to get off a train they boarded in Budapest hoping to travel to Germany, which has announced it will take up to 800,000 applications for refugee status. Hungarian authorities insist they must register the migrants according to EU regulations. Officials in Bicske say only about 16 people have exited the train voluntarily to be registered at a refugee camp, while hundreds of others remain on the train, chanting "no camp" and "Germany, Germany." Hundreds of thousands of migrants from Syria, Afghanistan and Iraq have been taking desperate steps since January to reach the European Union, trying to escape war and poverty for safety and opportunity. Greece and Italy have been the first stops for many of the migrants after making the dangerous crossing over the Mediterranean. French, German and Italian leaders said Thursday there must be a compulsory and fair distribution of refugees across the EU. European Parliament President Martin Schultz said EU member states, with a population of over 500 million, could absorb large numbers of refugees without any problem, as long as arriving migrants are not concentrated in only a few countries. In another development, the father of a young Syrian refugee whose body was found washed up on a Turkish beach is returning to his Syrian hometown. Abdullah Kurdi, whose son Aylan died along with his brother and mother on a capsized refugee boat, is traveling home with the caskets of all three family members to the flashpoint Syrian town of Kobani. The heartbreaking photograph of three-year-old Aylan, dressed in a red t-shirt and sneakers lying face down in the surf, ran on front pages across the globe and on social media. It made the toddler an instant poster boy for the refugee crisis caused by the Syrian war. Abdullah Kurdi (2nd R), father of three-year-old Aylan Kurdi, waits in front of a morgue in Mugla, Turkey, September 3, 2015. Aylan, his five year-old brother and his mother were among 12 Syrians who drowned when their migrant boat sank after leaving Turkey for the Greek island of Kos. Aylan's father survived the journey, but told reporters that all his dreams have been smashed.